FRESH 18oz glass bottles of Stubb's Legendary Dr Pepper Barbeque Sauce!! Charles Alderton made history in 1885 when he created the first batch of Dr Pepper in Waco, Texas. The story continued when C.B. Stubblefield opened his legendary Stubb’s Restaurant in 1968, also in Texas. Both men turned their passion for tinkering with recipes into two iconic brands with the perfect blends of delicious flavors. Today, Stubb's is making their own piece of Texas history by bringing these carefully crafted flavors to your barbecue in a sweet and peppery sauce. 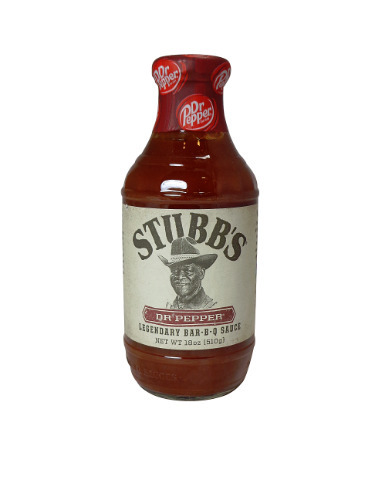 Stubb’s® Dr Pepper Bar-B-Q Sauce—here’s to a One of a Kind match made in Lone Star heaven.